Earlier this week we heard from Jenn Northington, the events manager at a WORD in Brooklyn, who said she was always looking for "events that are out of the ordinary, that invite audience participation, that take the average reading + Q&A and make it better, stronger, faster." Last month I attended an event at the Yankee Bookshop in Woodstock, VT, wherein I broke a piece of granite in two. How's that for action? This event was unique from minute one. 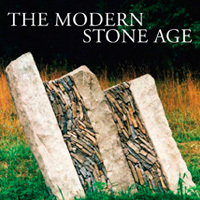 The author, Hector Santos, has just published a book about his work building stone walls. I received a Constant Comment email about the event about 10 days beforehand. The note promised a wall building demonstration. And so it was. Mr. Santos brought enough stones to build a small retaining wall, perhaps three feet long, on a table in the store. Now, my interest in landscaping extends as far as: "a pot of pink flowers would look nice over there." So I admit that not every bit of the presentation about drainage and cap stones and seams was applicable to me. Mr. Santos wanted to show how a piece of granite is split. It's an igneous rock (thank you, 8th grade science teacher) and so it doesn't cleave with a whack of the hammer like a piece of slate. Mr. Santos had scored and pre-drilled a 12" x 8" x 8" granite block. He placed some metal wedges in the three drill holes to demonstrate how clean, straight breaks were made. Then he asked for a volunteer. I waited a polite second to make sure nobody else was dying to break that rock. And then (hell yes!) I raised my hand. I got down on the floor and took up the hammer, giving each set of wedges a couple of polite whacks. Then the nice man told me I was going to have to hit them harder. My face turning red, I upped my game. And then I felt the rock start to give way. And with rice krispie-like snap crackle pop sounds, that chunk o' granite broke in half. And I did it. Me. With what my mother calls skinny chicken arms. Surely not every book signing can or should feature the destruction of granite blocks. But I did enjoy my moment of rock breaking. And of course I bought the book.